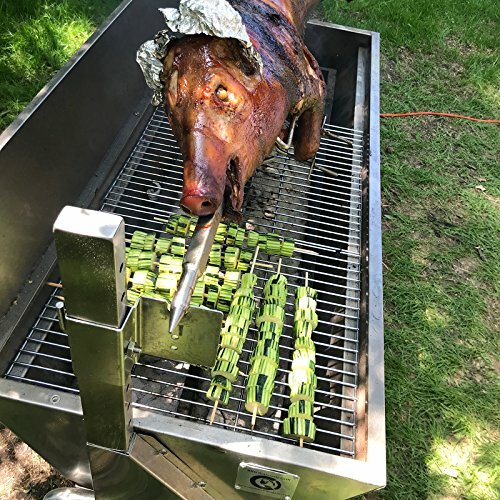 A “Whole Hog” or whole pig roast is an event designed to draw large numbers of people together to connect and celebrate. There’s something about being able to roast an entire animal, especially over a charcoal-fired rotisserie, that brings magic to the moment. Answering the call to the niche demand Commercial Bargains offers their BBQ Pig Lamb Rotisserie Roaster. It has a 47.5” charcoal firebox spanned by three stainless steel grates. The entire firebox is 19” wide. Deep inside the firebox, there are two, split, 6-inch charcoal channels. 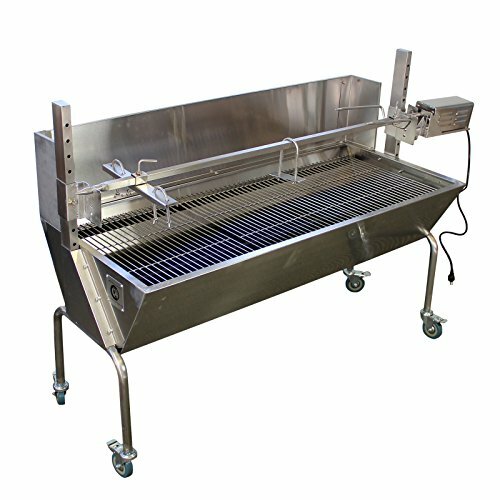 The entire body of the pig roaster is made from 201 stainless steel. 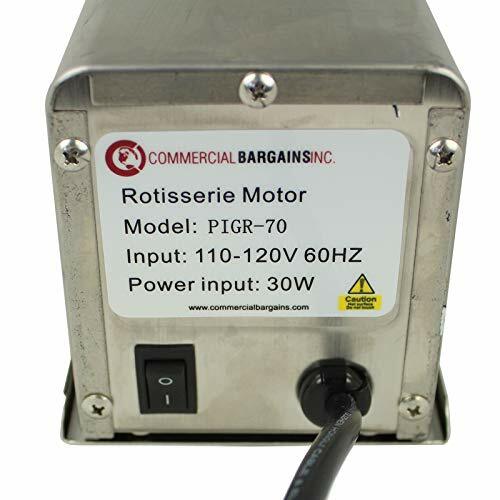 The electric motor that turns the spit plugs into a standard 110 outlet. You will need to make sure there is a reliable source of power nearby. The electric cord is a little on the short side. So, be prepared to keep a heavy-duty extension cord on hand. Commercial Bargains claim that it is capable of rotating at 4 revolutions per minute at its maximum capacity of 150 pounds. Yet you shouldn’t take that weight rating at pure face value. 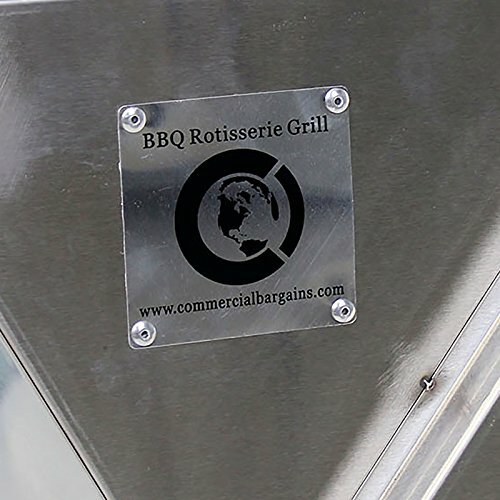 The vast majority of this charcoal rotisserie is made from 201 stainless steel. This is a relatively low-grade type of stainless steel, that is inferior to its most common replacements 304 and 316 stainless steel. It’s this little short cut that is likely the underlying force driving the “Commercial Bargains” low price. 201 stainless is blended with high amounts of nickel and manganese. This means it is rust resistant, but not impervious to rust. It means it is stain resistant but has the ability to develop stains over time. 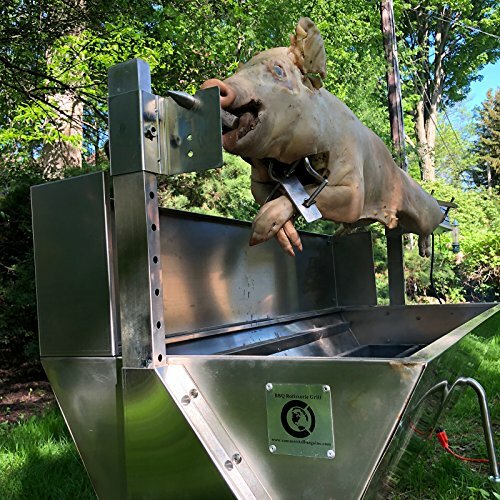 Ultimately, if you are going to be spit roasting a pig, lamb, or goat every weekend, this rotisserie isn’t going to have the long life that you might enjoy from one of its competitors. If you are going to use it two or three times each summer, and it will spend the rest of its life safely stored, then it’s probably in the price point sweet spot. When it comes to the stated weight capacity of the spit and the electric motor’s ability to turn it, there is some disparity. Commercial Bargains states that it can handle an animal weighing up to 150 pounds. This is an understatement. The total weight and torque it can handle are more like a 75 to 85 pounds, which is still a fair-sized pig, lamb, or goat. When it comes to assembly, there is very little to do. 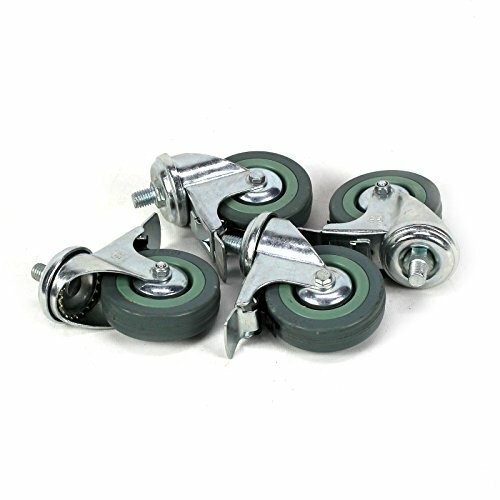 Given how long some of the components are, it would help to have two other people to hold things in place, while you fasten it. All told you should be able to get it unboxed and put together in a little over an hour. As discussed above, the maximum capacity of the spit and the motor is in the 75 to 85-pound range. You might be able to get a little more out of it if you improvise some steel rods to reinforce the spit. The spit itself can be adjusted in height from 5.5-inches to 16.5-inches. The lowest setting is basically meant to accommodate a spit loaded with whole chickens, ducks or Cornish game hens. The highest setting is meant for pigs, lamb, and goats. Even at the highest setting, you might have to cut the shanks off the animal. When it comes to the fire channels, charcoal briquettes with some chunks of wood interspersed. There isn’t a traditional hood to trap the smoke, so don’t worry too much about what kind of accent flavor of wood you want to use. Honestly, some chunks of dried oak with charcoal will give you pretty much the same results as hickory or apple wood. When it comes to roasting chickens and ducks. You would fill a few heavy-duty aluminum foil bread pans with water and place them between the two channels. Halfway through the roasting process, you can add some quartered red potatoes, with a little more water. They can then simmer in the smoky drippings collected from the bird. 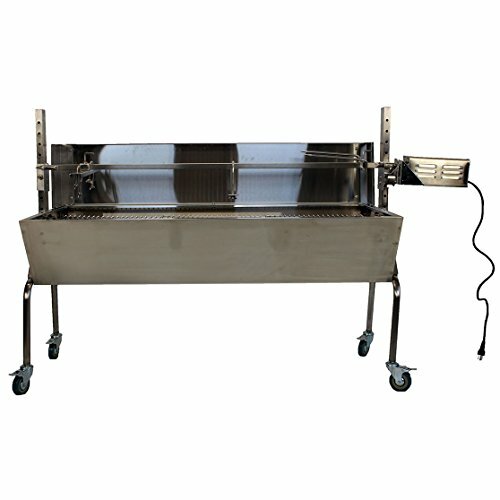 This unit is intended to primarily be used as a roaster or rotisserie. 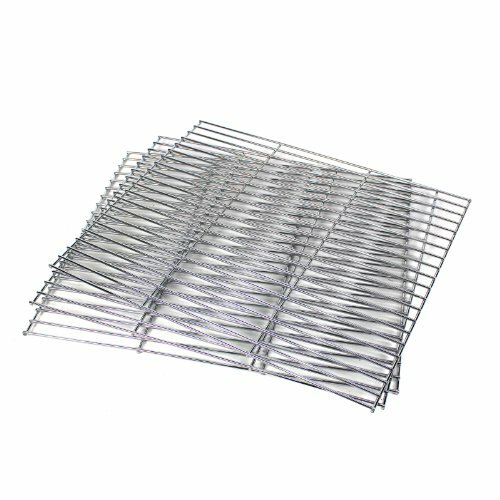 Still, there are three traditional stainless steel grill grates that span 47-inches long and 19-inches wide. So, if you do want to repurpose it as a basic charcoal grill, it offers a staggering 902.5 square inches of grilling space. Any rotisserie is going to be a fair amount of work to clean. This is ramped up a little bit with large charcoal rotisseries. It would be nice if Commercial Bargains had designed some kind of ash or drippings management system. As such you will be doing some scooping, scraping, and wiping after every grilling session. Laying down some sheets of heavy-duty aluminum foil between the charcoal channels, or setting some disposable aluminum bread pans will help minimize drippings cleanup. If you are looking for a rotisserie that can truly handle the weight of a “Whole Hog” you may have to look for it behind a unicorn or Sasquatch. 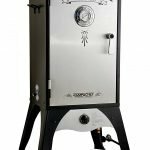 If you are looking for a charcoal rotisserie that can handle four or five whole birds, or the occasional small pig, the Commercial Bargains charcoal rotisserie might just meet your needs without crippling your checking account. Just keep in mind not to overload the spit. If you are careful with it and take the time to take care of it, this charcoal rotisserie roaster can take care of you for quite a few years. 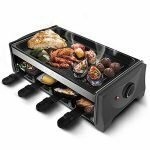 If you are looking for something heavy duty or a charcoal rotisserie that you can use on a weekly basis, then you might want to look elsewhere. 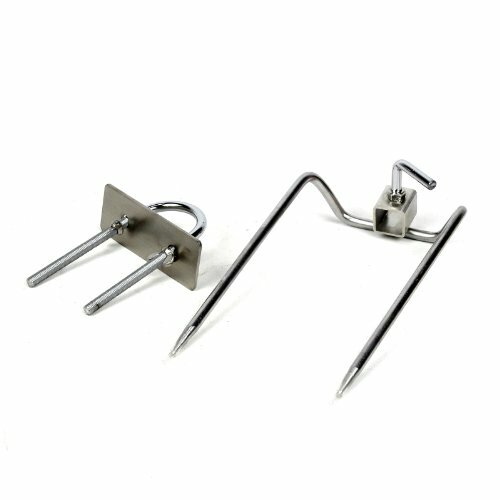 Recommended Skewer weight capacity is 154 lbs.